Noted as an IGI Global Core Reference Title in Environmental, Agricultural, and Physical Sciences for 2019. Addressing global climate change is a monumental battle that can only be fought by the leaders of tomorrow, but future leaders are molded through education and shaped by the leaders of today. While the pivotal role of education in spreading awareness of climate change is one universally espoused, equally universal is the recognition that current education efforts are falling woefully short. 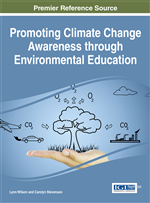 Promoting Climate Change Awareness through Environmental Education stems the rising tide of shortcomings in environmental education by plugging a known gap in current research and opening a dialogue for the future. Targeting an audience of young scholars, academics, researchers, and policymakers, this volume provides a much needed dam of empirical evidence regarding the role of youth education in addressing one of the greatest challenges of our age. This timely publication focuses on topics such as building resilience to climate change, green learning spaces, gender issues and concerns for developing countries, and the impact of young adults on the future of environmental sustainability. Artists, educators, and other contributors suggest ways to engage university and pre-university students with the science, engineering, social, and policy processes they can use to make their community more resilient to environmental change. They focus on developing a deeper understanding of social learning in the transition from awareness to action. Their topics include climate change education through art and science collaborations, insights from the experience of university students with conferences as learning spaces on climate change and sustainability, the use of different presentation formats in an exhibit at a science center to communicate sea level rise, Georgia House Resolution 689 on tackling climate change through educational awareness, gendered vulnerability and adaptation to climate change, and the place of concerns for posterity in global education for sustainable development agenda. Lynn Wilson is Executive Director for SeaTrust Institute, a scientific and educational nonprofit organization in the Pacific Northwest. She is also senior analyst for the consulting firm OSSIA through which she has been offering research, conflict management, strategic and policy guidance for over 25 years. Her work appears in books, lectures, workshops, global and regional conferences and in academic, technical and trade publications. Recent publications include Environmental Issues, Policy and Management Collaboration Toolbox (2011), book chapters in E-Research Collaboration: Frameworks, Tools and Techniques, (2010), and Handbook of Research on Electronic Collaboration and Organizational Synergy (2009) which she co-edited. Current research on climate and health collected as Co-Chair of the United Nations Framework Convention on Climate Change (UNFCCC) Coalition on Health and the Environment: Climate Change Initiative, in collaboration with global climate and health professionals, is being continuously presented through the United Nations climate change negotiations process throughout 2011-2013 and is accompanied by a partnership with the African NGO Coalition Co-Chair to deliver local training on climate adaptation and disease surveillance throughout the globe. Research from the Coalition and the local projects inform the book Climate and Health Literacy: A Guide to Understanding and Action scheduled for publication in 2012. Dr. Wilson develops and delivers face-to-face and online courses related to science and policy, sustainability and collaboration and is a graduate instructor for Environmental Policy in the School of Legal Studies at Kaplan University. As Director of the Consortium on Climate Change and Population Health, she leads a project for innovative research and publications on climate and human health concerns. Lynn serves on advisory and review boards for policy, education, science and the environment and is Head of Delegation, SeaTrust Institute. Carolyn Stevenson, Director of Education AWARE (Action Within a Resilient Environment) Veteran educator and qualitative research expert Carolyn Stevenson is Director of Education for SeaTrust Institute. She is also leading the US and global youth programs for middle and high school students, AWARE. Under her direction, the program provides a forum for students to acquire public service credits required for high school graduation in many US cities as well as experiential environmental education that enhances applications to top universities while giving back to their local communities. Carolyn has over 15 years teaching and administrative experience in higher education. She holds a Master of Arts degree in Communication, Master of Business Administration, and Doctor of Education with an emphasis in Higher Education. Prior to pursuing a career in higher education, she worked in the publishing field and served as a technical writing consultant. She currently serves as committee member for the American Educational Research Association’s Division D: Research Methods for the Early Career Award; Associate Editor for the International Journal of Technologies and Educational Marketing (IJTEM), published by IGI-Global; Editorial Board Member and Reviewer for the Journal of Education and Learning published by the Canadian Center of Science and Education; and Membership Committee Member for the Qualitative Research Special Interest Group (AERA). Recent publications include a chapter entitled: Leading across Generations: Issues for Higher Education Administrators published in the Handbook of Research on Transnational Higher Education Management, by IGI Global and Technical Writing: A Comprehensive Resource for Technical Writers at all Levels, (Martinez, Hannigan, Wells, Peterson and Stevenson) Revised and Updated Edition, Kaplan Publishing. She is currently co-editing a text entitled Building Online Communities in Higher Education Institutions: Creating Collaborative Experience with an anticipated publication date of February 2014.